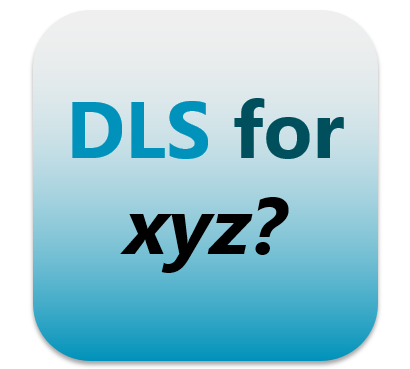 How to use DLS for material xyz - required conc and index? 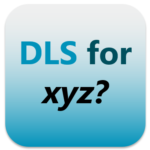 How can I use DLS for sample xyz? What sample concentration / refractive index is needed for reliable DLS size measurements? In Dynamic Light Scattering (DLS) intensity fluctuations in the sample are analyzed to obtain size information on the sample. The technique is applicable to a wide size range from sub-nanometer up to a few microns. In order to obtain a meaningful result, a minimum scattering signal strength must be present. Malvern’s Zetasizer Nano software contains a calculator to help estimate the required minimum concentration. If anyone else has done DLS on this material then the Zetasizer can measure it. A quick and easy method to check would be google scholar. 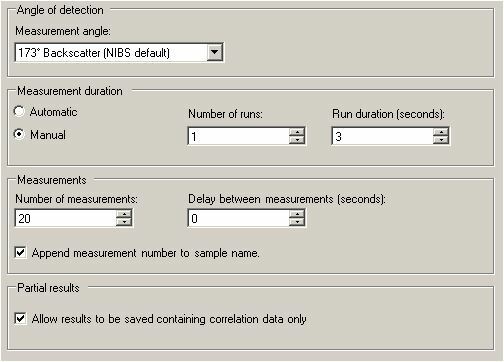 To find the recommended concentration for the new sample type, there are two tools available in the software. How to size molecules in solution? A good starting point for molecules (for example proteins, polymers) with an expected molecular weight is the minimum concentration calculator. 1 amino acid ~ 0.11kDa). As seen in the screenshot example to the right, the required minimum concentration for size measurements in the Zetasizer Nano S would be 0.02 mg/mL, so anything larger than that would be fine. How to size particles in solution? A good starting point for particles (for example standards, virus, virus-like particles, emulsions) with an expected size is the Concentration and Scattering calculator. and enter the radius, for example 110nm, the instrument model, and attenuator (select 11 to find the highest sensitivity). By varying the sample concentration, the expected count rate is shown in the lower right corner, as long as it is above 200kcps the sample should exhibit enough scattering and this is suitable for a DLS measurement. In this example shown on the right, at the concentration of 1.0*E-5 % volume fraction (=1E-7 volume fraction) the sample would scatter enough intensity signal to obtain a reliable correlation function. To find the refractive index of the material, please note that this is irrelevant for intensity based results and only potentially important for volume based results, with a list of some common refractive index values was posted in a prior blog. Why do I get a size for just clean water? Is the water really clean? Occasionally dust is present in cuvettes stored in the open (rinse with copious amounts of clean water), filters may be contaminated, the storage container may have some issue (algae growth?) – purchase a bottle of distilled water at the grocery story and try that distilled water for rinsing and filling the cuvette for the measurement. Do not overfill, just to the fill line indicated on the pictogram under the sample holder lid. For a classic Zetasizer Nano ZS, the scattering intensity count rate should be ~40-80kcps (kilo counts per second). Alternatively, try making single short runs, to see if there is a large variability in subsequent runs indicating the presence of larger scattering objects, i.e. some contamination in the water. 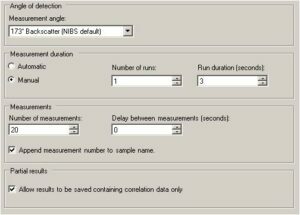 To do so, set up the measurement for size for backscatter, manual, single runs of 3 seconds, 20repeats, and allow partial results to be saved (or correlation function data only, even if it is not like a nice correlogram). And fee free to send this to our help desk for interpretation.